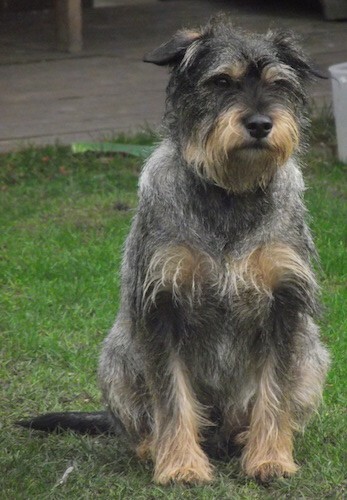 "This is my lovely Standard Schnauzer / English Toy Terrier (Manchester Terrier) x boys. 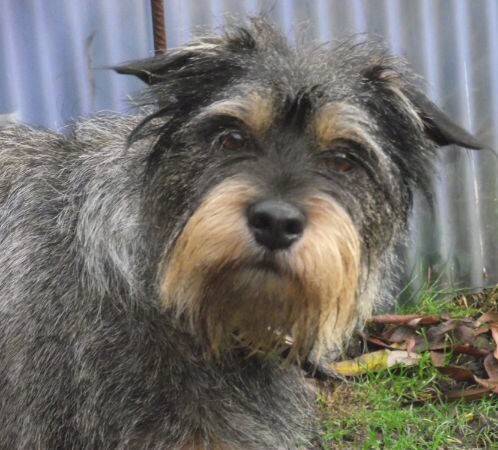 We had originally intended to get a Standard Schnauzer but when the breeder had a 'miss-mate' with a toy terrier we decided to go for them instead and they were so gorgeous we bought 2 of them! 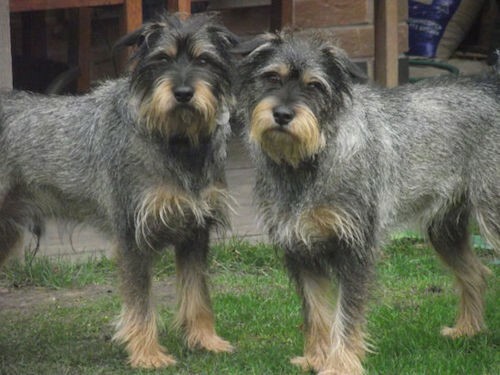 They are smaller than a Standard Schnauzer but much larger than a English Toy Terrier. It is amazing how it even happened as their mum is tiny and their dad is one of the breeders largest Schnauzers (which is why he never thought that would happen!!). They are very happy, bouncy dogs. Great with children, great with our cats (one of which was already with us when we got the pups and 2 which we rescued as kittens in June last year) and generally very playful around other dogs. They were hard work, particularly when they hit their 'teens' (in dog years of course. They are only 3 years old) but after almost despairing we employed the 'rules' and now we have two fantastic dogs. They do need a fair bit of exercise, if we don't take them out every day they become quite boisterous, but they have never destroyed anything through chewing etc. I think that it would be a case of them an inch and they'd take a mile if we didn't maintain 'rules and regulations' but we don't mind, it keeps us on our toes!! They are very much scent oriented too so smell is a good way to help train them."